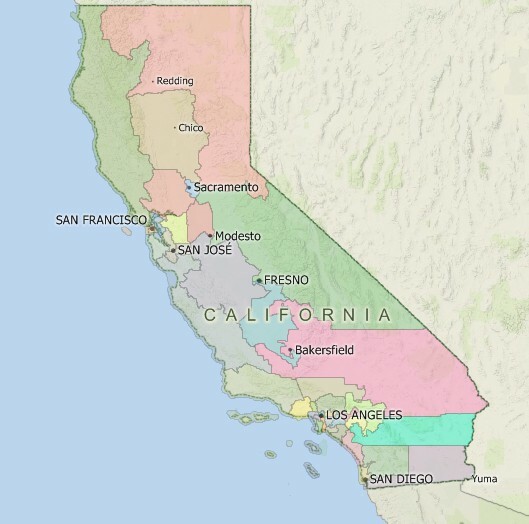 California Citizens Redistricting Commission (CRC) is a 14-member Commission that Californians created by passing the Voters FIRST Act at the November 2008 general election. The 14 commissioners define the geographic boundaries for 80 Assembly districts, 40 Senate districts, and four State Board of Equalization districts so that they contain reasonably equal populations. The CRC used Maptitude for Redistricting to accomplish this task in the short time provided to the commission. To the public, the redistricting process is a mystery, with questions about transparency, openness, and trust. Maptitude allows an examination of different ways to address redistricting itself and supports the political needs to engage the public, too. In the past decade, California voters have worked to increase their voice in the democratic process through passing laws that wrestled power from California legislators. Through Propositions 11 and 20, Californians took a stand and stated that they should be the ones leading the process for drawing Assembly, Congressional and Senate district lines. In 2010, this line drawing process advanced when the California Bureau of State Audits (BSA) selected a new California Citizens Redistricting Commission (CRC) tasked with guiding an independent redistricting process. The 14-person commission accomplished the complex task of redrawing 177 districts in only eight months. The CRC used an entirely open and public process to create districts. The CRC held open meetings across the state of California with written submissions by over 2000 groups. The line-drawing process was entirely public and the commission had to explain and justify why each district was drawn the way it was. A 2013 report, commissioned by the League of Women Voters of California in partnership with The James Irvine Foundation, found that the commission made a concerted effort to make the process more democratic and nonpartisan. The report, "When the People Draw the Lines," finds that California's first citizen-led redistricting commission successfully democratized redistricting in the state. In fact, among the estimated 1/3 of the voters who were familiar with the work of the commission, over 66% of the public approved of the CRC district maps. "The redistricting software, Maptitude for Redistricting, facilitates the creation of districts with equal or nearly equal populations. The software allowed mappers to adjust district boundaries to meet the population equality requirement." Designed with the help of redistricting professionals and other stakeholders, Maptitude for Redistricting has a comprehensive set of the features that redistricters need. Redistricting plans are designed with all kinds of objectives and each state has its own standards for creating Congressional and legislative districts. In addition to equalizing the population of districts and complying with Federal requirements, criteria may include attempting to create compact districts, trying to keep political units and communities within a single district, and avoiding the drawing of boundaries for purposes of partisan advantage or incumbent protection. Maptitude Online Redistricting is web-based redistricting software designed for governments or organizations that want to provide their members or the general public with a means to draw and report redistricting plans. Because the PC and online versions share common file formats, plans developed online can be electronically submitted to the central redistricting office, opened in the PC-based software, and analyzed to the full extent as if they had been created using the PC-based software. A fully transparent and open process is required to produce boundaries worthy of a democratic process. The report, “Oakland's Low-Income Communities Look to Gain Electoral Power Through Redistricting” shows that anyone can propose a map by using the online Maptitude redistricting application. California Citizens Redistricting Commission (CRC) is tasked with guiding an independent redistricting process. The Commission must draw district lines in conformity with strict, nonpartisan rules designed to create districts of relatively equal population that will provide fair representation for all Californians.